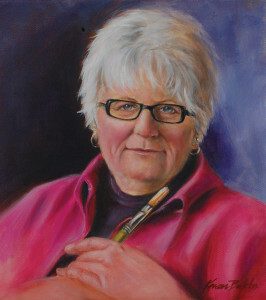 The FMVA established the Member of the Year award in 2011 to celebrate the visual artists of the area and their contributions to the organization. We wanted to recognize their involvement and support because without the many hours of service provided by these artists the FMVA could not be providing the range of opportunities it does today. The board of the FMVA has chosen Brad Bachmeier as their 2018 member of the Year to celebrate his long career as a professional ceramic artist and to honor his advocacy of public art and arts education. Brad is program coordinator and professor of art education at Minnesota State University Moorhead, and he’s a sought-after workshop presenter and artist in residence. He has served on the board of directors for The Plains Center for Creativity, The Rourke Art Museum and The Arts Partnership, and he is currently vice chair of the North Dakota Council on the Arts. 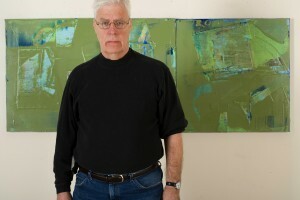 He has an extensive resume of solo, two-person, and multi-artist exhibition all over the country, and his list of awards, grants, and honors includes the 2009 North Dakota Governor’s Award in Art Education and a nomination for the Carnegie Foundation’s U. S. Professor of the Year in 2017. Particularly impressive honor include having a piece of work in former First Lady Michelle Obama’s personal collection, being one of only 19 brick sculptors in the United States and receiving the 2007 National NICHE Award in wheel-thrown ceramics. Thank you, Brad for your valuable service to our arts community and for your friendship-and especially for choosing to work in education inspire the next generation of great art teachers! The board of the FMVA chose Meg Spielman Peldo as the 2017 Member of the Year to salute her service to the organization, to honor and acknowledge her advocacy for the arts, and to congratulate her on her artistic success. In her downtown Fargo studio, Meg explores alternative methods employing a variety of art mediums—from photography and mixed media to clay. She combines elements that often result in a constructed style. Her recent work captures portrait style images of wild horses and bison as fine art pigment photographs and assembled images on paper and canvas. Known for her contemporary twist on the genre of still life, Meg is the artist/creator of a photo essay of quirky art bras titled “A Bra Anthologie,” and the author of the award-winning book “no lumps thank you. a bra anthologie.” Currently a member of the Plains Art Museum Board of Directors, Meg also served on the Katherine Kilbourne Center for Creativity development committee both as a member of the Fargo Public Schools Board of Education and later as a Plains Art Board member. Meg recently completed 47 works for the Family Birth Center at the new Sanford Hospital and is creating another body of work for the new Vibra Long Term Acute Care Hospital, Fargo. Meg is an exceptional artist, teacher, and arts advocate, and the FMVA thanks her for sharing her gifts with our organization and our community. 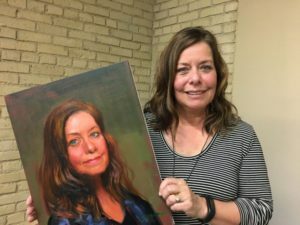 You can find her work at the Revland Gallery, or at her Fargo studio—where you can find Meg and congratulate her. The board of Fargo-Moorhead Visual Artists has chosen Jon Offutt as the organization’s 2015 Member of the Year. Jon is a founding member of FMVA, and he has been an active and reliable champion for the organization since those early days—serving as president, board member, on several committees, and as the executive director of the Studio Crawl. Doing business as “House of Mulciber,” named for the Roman god of fire, Jon creates blown vessels and sculptures in his fascinating south Fargo studio and also in communities across the region where he demonstrates the art and science of glass with his mobile glassblowing studio. Countless school children, and their teachers and parents, have been educated, awed, and perhaps inspired by Jon’s unique demonstrations. 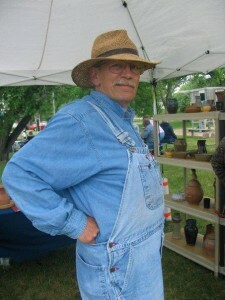 Jon has been blowing glass for more than 30 years, and he’s been a tireless arts advocate for nearly as long. 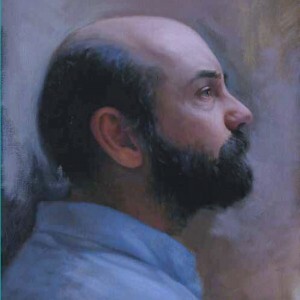 His influence and guidance has been appreciated by the FMVA and many others, most notably his service as a studio glass instructor at MSUM; as a founding member and Mayor of New Bohemia ND; and the years he devoted to the Lake Agassiz Arts Council board, where he served a term as president. He was honored in 2007 as the Lake Agassiz Arts Council “Arts Advocate of the Year.” Jon was born in Hawaii and his family moved to North Dakota when he was young. He graduated from Fargo North High School and is one of the school’s Alumni Hall of Fame Inductees. He earned his undergraduate degree from MSUM, and he earned a master’s degree in glass from Southern Illinois University in Carbondale. Look for Jon’s beautiful glass in Fargo at Reed & Taylor Antiques, Uptown Gallery, and Plains Art Museum. 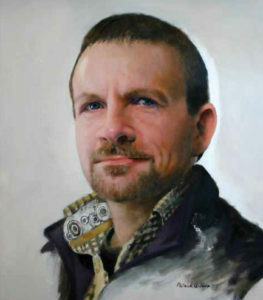 The Fargo Moorhead Visual Artists honors and celebrates Timothy Ray as its 2014 Member of the Year, even as it continues to mourn his loss to cancer last year. Timothy Ray was born in Indian Head, Saskatchewan in 1940, attending high school at Sheldon Williams Collegiate in Regina, Saskatchewan. 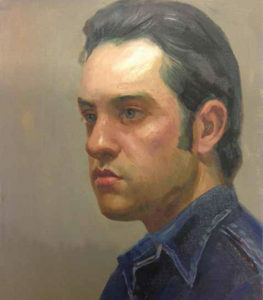 He went on to complete a Bachelor of Fine Arts degree as well as an Interim Collegiate Teaching Certificate at the University of Manitoba and a Master of Fine Arts degree at the University of Arkansas. He taught at several high schools in Manitoba, and at the University of Arkansas, Pikeville College in Kentucky and at Moorhead State University where he retired as a Full Professor in 1996. Influenced by some of the most exciting periods in Modern art — abstract expressionism, Pop, and Minimalism, to name a few — Tim found his personal oeuvre in the freedom of abstraction tempered by highly disciplined and labor-intensive processes. 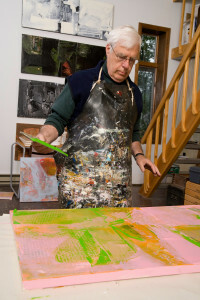 His paintings explored similarity & contrast, rhythm & repetition, and harmony of color in his work, and at times utilized shaped canvas, sprayed geometrics, handmade papers and collages to create a uniquely memorable body of paintings.Tim’s work was exhibited widely throughout the United States and Canada and is held in numerous public and private collections. He received many awards for his work as well as academic awards. Besides the significant impact of thirty-six years as a dedicated artist and teacher at MSUM, Tim’s commitment to the visual arts in our region could be seen in his activities as a founder and active member of FMVA. A strong sense of ethics made Tim a natural for leadership in the area of professional practices. He urged the FMVA to formally adopt standards and guidelines for artists and arts organizations to operate responsibly vis-a-vis each other and the community at large. Tim saw a role for FMVA in providing access to practical information about both the creative and business sides of being an artist. FMVA remains committed to continuing to build on Tim Ray’s visions for the organization, knowing that his singular dedication to the arts community of Fargo Moorhead will be appreciated for years to come. The FMVA is proud to present Brenda Luthi as our 2012 FMVA Member of the Year. Brenda’s commitment to the visual arts is a priceless asset to our community as she works tirelessly coordinating exhibitions, advocating for artists, and educating the artists of tomorrow. During Brenda’s two years on the FMVA Board of Directors, she helped implement numerous opportunities for regional artists in addition to ensuring the healthy future of the FMVA through her careful procedural documentation. In addition to being a talented artists and a fierce advocate for the arts, Brenda is also an acclaimed visual art teacher at West Fargo High School. 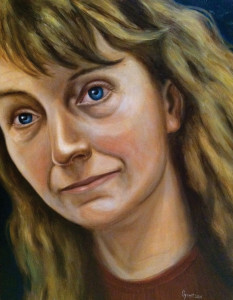 As a teacher, her compassion and skill lay essential groundwork for new artists. On top of all her art related responsibilities, Brenda also finds the energy to raise her two great children, Ally and Ryan, with her husband Chaun. Thanks for all you do Brenda! We are so proud to have you as our 2012 FMVA Member of the Year. Talented potter, painter and owner of Marbakka Studio.